It has been a while since I last updated on my wedding preparation. We pretty much didn't do anything during this period. Then suddenly the floodgate opened, we check out three different wedding vendors in one Sunday afternoon - thus the name Super Sunday. 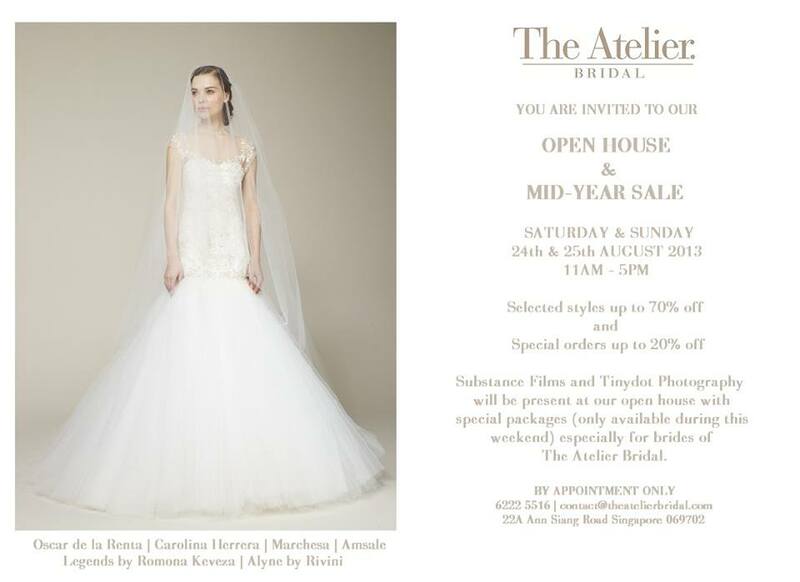 I found out that The Atelier Bridal is having a sale on Singapore Brides on Saturday night, immediately drop them an email and secured the last appointment available at 12:45 pm the next day. 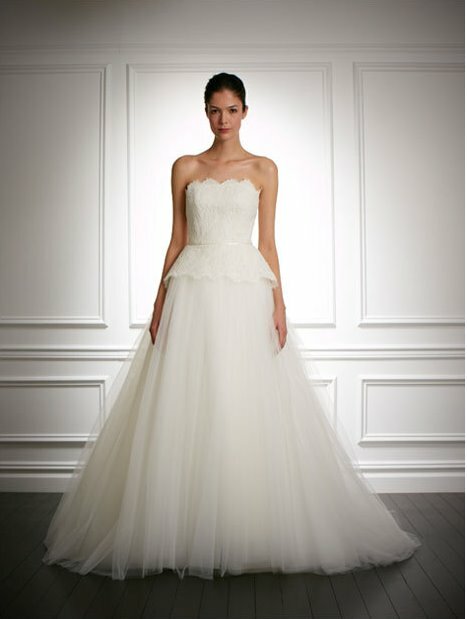 I have been eager to check out The Atelier Bridal since I found out they are bringing in US-label wedding gown. 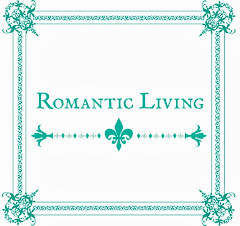 As a bride-to-be who has been heavily bombarded by American wedding industry ( No thanks to Martha Stewart's Wedding, David Tutera and WE channel on Mio TV), of course I am influenced to see them in real person. I have seen their bridal gowns at Alkaff Mansion Wedding Fair and found their quality were quite nice - not overwhelming but better than most gown you got off the package. I am interested to check out the workmanship of these designer label dress more closely. Moreover, one can't judge a dress without trying them on (the whole idea of online clothes shopping still baffled me), so I decided to give them a try. The Atelier Bridal is located at Ann Siang Road. Viewing is by appointment only, which is great as I got their full attention and didn't feel rushed or have to try out various gown in front of strangers. 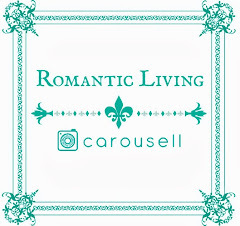 I find trying wedding gown is a very personal and intimate experience and having to try them in a small room full of unknown people really takes the charms away; not to mention the pressure from other brides who are waiting for your changing room. The shop is tastefully decorated with 3 panels of full length mirrors for you to look at yourself. 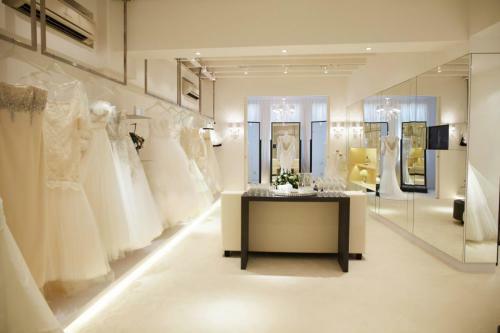 The trying experience is one of the better ones I had so far, and comparable to Designer Bridal Room in KL. The Atelier Bridal. Picture from their blog. There's around 20~30 dress on the rack during my visits. If I remember correctly, the gown ranges from $3,000 ~ $13,000. I tried 4 dresses from Alyne by RIVINI, Carolina Herrera, Marchesa and Amsale. Unfortunately, I didn't get the chance to try Oscar de la Renta. The first 3 dresses are in the range of $5k while the last one by Amsale is $8K. The 4 dresses I tried. Top left: Alyne by Rivini. Top right: Carolina Herrera. 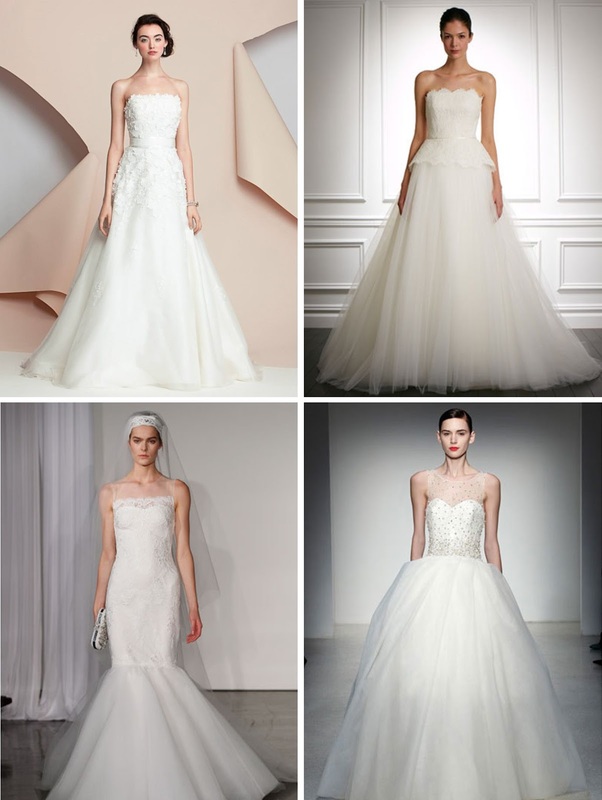 Bottom left: Marchesa. Bottom right: Amsale. The first dress is Hazel from Alyne by Rivini. I like the flowers detailing on the bodice but is a bit worry about their extension all the way to the upper hip, which creates a drop waist impression. 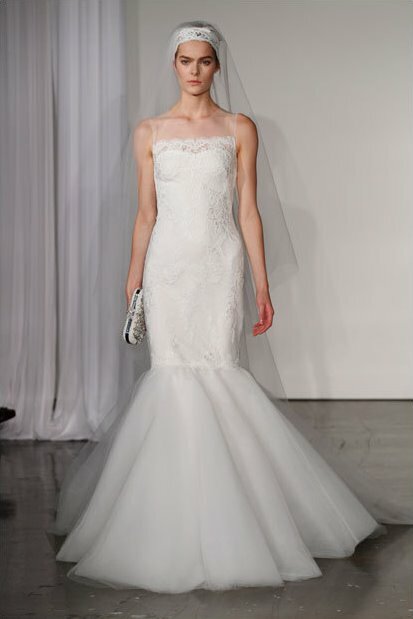 Drop waist is pretty popular for the Caucasian brides since it elongates your figure IF you are tall enough. At my 160 cm height, it only emphasis how short my legs are (T.T). The bodice of this dress is softer than my expectation. I felt a soft bra pad sewn into the lining, but I was advised to wear a bra while trying the dress. That's interesting. I half-expected that gown at this price point would have a built-in bra and corset, which is the case when I shop at Designer Bridal Room. On a side note, the construction of bodice is very important for strapless dress. The proper placement of boning creates a beautiful bust line, gives the impression of small waist and most importantly hold the strapless dress in place (so you won't keep pulling your dress up throughout the night). A lot of people thought that the bust holds up a strapless dress, which is not true. A properly constructed strapless dress would have a bodice that keeps the form itself, and secured by a waist stay that is strong but comfortable. In fact, boning is also used in wedding gown with strap to accentuate the female curve. However, I think that there is a trend among the top designer in using less boning to give the dress a softer and de-construct look. But I guess most brides would still like to looked primed and proper for their wedding and not everyone has the body shape that able to pull off a formal dress without some help. The next dress I tried on is Justine by Carolina Herrera. 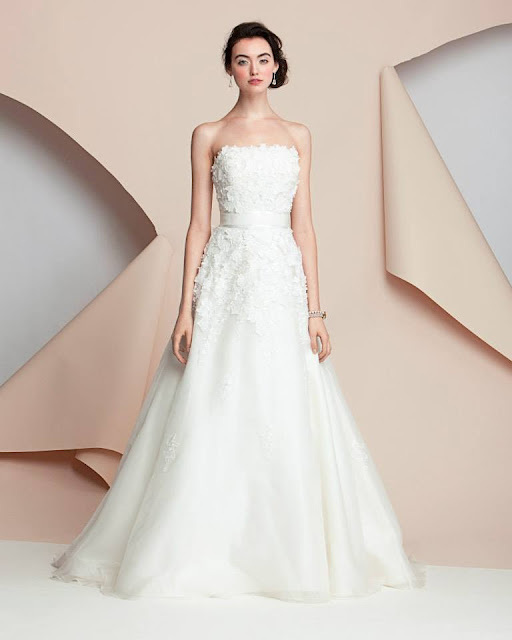 I choose this dress because I love lace and tulle, and thinking that the flare out at the hip can emphasize tiny waist and conceal big hip. Unfortunately, this is not the case. I am not sure whether there is some discrepancy between Westerner and Asian body type or it was done on purpose, I found that the boning does not really follow my bustline. As a result, there is a huge gap between the bodies and my body, which end up not flattering at all. The third dress is from Marchesa Fall 2013 collection. This dress has no boning or sewn in-bra cup. I don't think it even has a lining. I must say I was pretty shocked when I first tried it on. Even the cheapest wedding gown would have these albeit they most likely will be very low quality. But very soon I realized that this is probably purposely designed this way. What you probably can't tell from the picture above is that the body-hugging part of the dress are actually made of high quality stretchable materials which is then overlaid by lace. I must say this is a pretty innovative way to construct a mermaid dress easily. Just think of all the alteration needed to make this mermaid dress fit every curve of yours if it is made of typical materials like satin. And the dress wouldn't fit you if you happen to lose or gain some weight right before your wedding. The problem of such materials is that it can't have additional layers to accommodate boning, bra pad, lining etc, and thus the lacks of it. As a result, the upper part of this dress is very thin. Good for hot and humid Singapore. But bad as you can see one underwear easily. It also feels like wearing a swimsuit, where every inch of your curve and lumps will be displayed clearly. Unless you are a super model, you probably need a special underwear with proper corseting that doesn't show through the dress, which I think it is an additional hassle and risk (of not able to get a suitable one). Nevertheless, it is my favourite dress out of the four I tried. The pattern of the lace is beautiful and the lace itself is very soft and delicate. 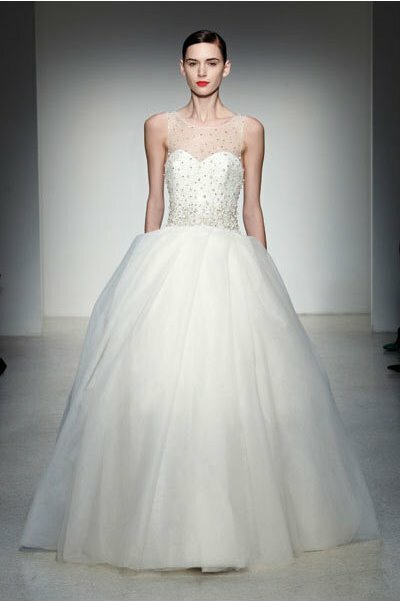 I love the luxurious amount of organza skirting at the bottom. But Alas, I don't have a super model body so this is out for me. The final dress is Plaza by Amsale. Tried this dress because the beading on the bodies is beautiful, which is unfortunately not able to captured by photo. However, the cut of the dress just doesn't flatter me, which is weird since I thought a ball gown cut like this should be easy to pull off. I guess these wedding gown created in the west might not fit Asian body type perfectly, thus the dresses I found here doesn't not complement my body type as well as Lusan Mandongus or Annasul Y in Designer Bridal Room. Later on, the Japanese owner from Tirtha Weddings told me the same thing about western eastern body type differences. So, they work with Italian gown designer to create high quality gown for Asian brides which is available for rent or for sale. That's it for my Super Sunday update for now, I will continue with Tirtha Weddings and 1-Altitude in the next post.